Sunrise All Suite Resort (ex. 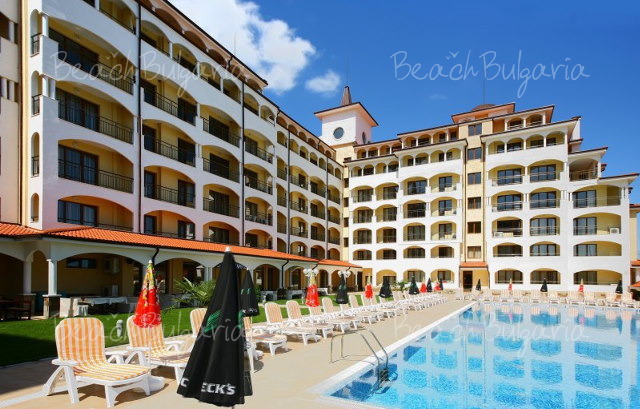 Sunrise Apartment Complex) is situated 200 m from the beach, 3 km to the north from the city of Obzor. It complex is reachable via an asphalted alley. 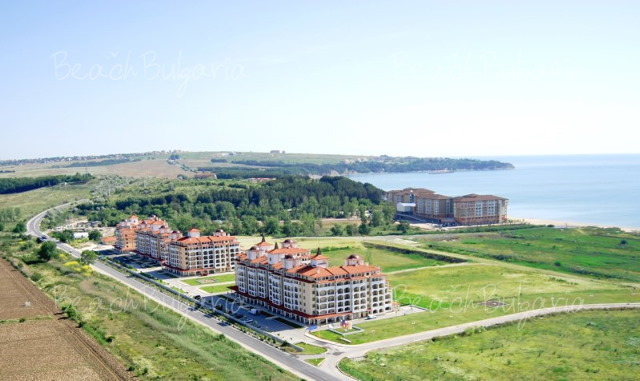 The complex is located 65 km from Varna Airport and 75 km from Burgas Airport. The hotel features 150 one-bedroom and two-bedroom suites with a living room, bedroom, bathroom, private balcony with a sea view, kitchenette (coffee maker, refrigerator, kettle, washing machine, stove), dining table, Wi-Fi internet (extra charge), telephone, TV, safe (for rent), air conditioners. The restaurant with wood terrace offers Bulgarian and international cuisine, themed dinners and show cooking. The a la carte restaurant offers Mediterranean kitchen. The Lounge Bar, the Snack Bar and the Pool Bar provide refreshing drinks and food. 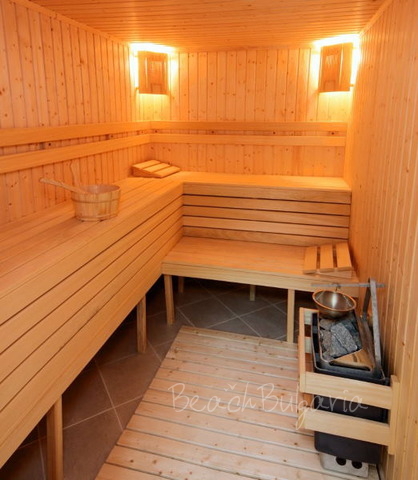 Massages, variety of treatments, fitness, sauna, steam bath /for extra charge/. - Table tennis, Darts, Frisbee, etc. 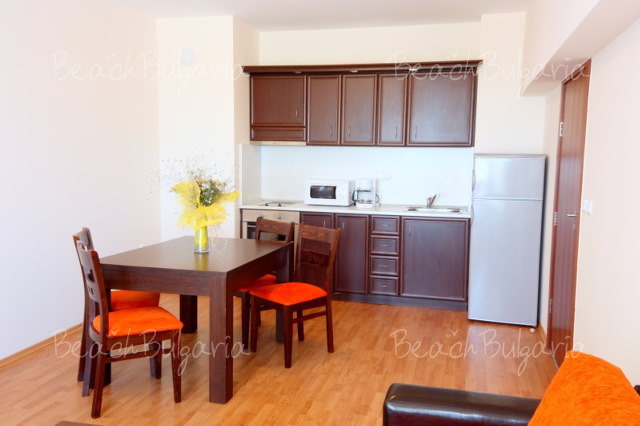 - Foosball, Billiards, Mountain bikes, Water sports /extra charge/. 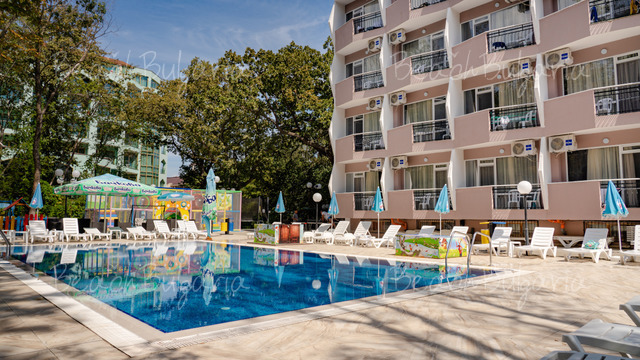 Mini Club, 3 Children`s pools, Children`s Animation, Children`s playground, Baby cots, Baby seats in the restaurant. The facilities for children are free of charge. The complex offers a conference hall for 30 guests for holding meetings, seminars and other business events. - Drinks until 24:00 (soft drinks, local beverages, wine, drought beer). - A la Carte Restaurant (19:00 – 22:00) - only 1 meal per stay and valid for a minimum stay of 7 overnights. - Snack Bar (10:00 – 18:00), Fossil Bar & Lounge (10:00 – 24:00), Lobby Bar (09:00 – 23:00) - not included in the AI. The prices are in Euro per room per night, all inclusive. Guests of the hotel can use swimming pool, parasole, sunbed near the pool and on the beach (upon availability) and fitness for free. * Cancellations can be made free of charge providing details of this are received at least 14 working days prior to check-in time on the day of arrival and 21 days during 07 July - 21 August 2019 - cancellations made after this period will incur a fee equivalent to the cost of 3 night's accommodation. Please, post a comment on Sunrise All Suite Resort. Dinners (only for bufet meat type ) is various and delicious. I am satisfied for holiday in the SUNRISE hotel. 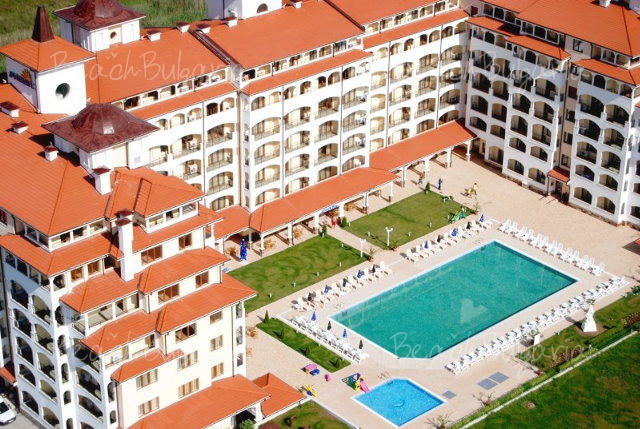 VERY thank for Diana Kalcheva from BeachBulgaria reservation service - exelent contact when create reservation and decided small problems. Certainly,we'll come back next year.Many thanks.